Few, probably, will deny that there are some things in religion about which we may think other people hold very erroneous views, and are, notwithstanding, in no danger of being finally lost. About baptism and the Lord’s Supper, about the Christian ministry, about forms of prayer and modes of worship, about the union of Church and State, about all these things it is commonly admitted that people may differ widely, and yet be finally saved. No doubt there are always bigots and extreme partisans, who are ready to excommunicate everyone who cannot pronounce their Shibboleth on the above-named points. But, speaking generally, to shut out of heaven all who disagree with us about these things, is to take up a position which most thoughtful Christians condemn as unscriptural, narrow, and uncharitable. On the other hand, there are certain great truths of which some knowledge, by common consent, appears essential to salvation. Such truths are the immortality of the soul, the sinfulness of human nature, the work of Christ for us as our Redeemer, the work of the Holy Ghost in us, forgiveness, justification, conversion, faith, repentance, the marks of a right heart, Christ’s invitations, Christ’s intercession, and the like. If truths like these are not absolutely necessary to salvation, it is difficult to understand how any truths whatever can be called necessary. If people may be saved without knowing anything about these truths, it appears to me that we may throw away our Bibles altogether, and proclaim that the Christian religion is of no use. From such a miserable conclusion I hope most people will shrink back with horror. To this statement, I frankly admit, the first and two last papers in the volume form an exception. Inspiration, Election, and Perseverance are undoubtedly points about which good men in every age have disagreed, and will disagree perhaps while the world stands. The immense importance of inspiration in this day, and the extraordinary neglect into which election and perseverance have fallen, notwithstanding the Seventeenth Article, are my reasons for inserting the three papers. The name which I have selected will prepare the reader to expect no new doctrines in this volume. It is simple, unadulterated, old-fashioned Evangelical theology. It contains nothing but the “Old Paths” in which the Apostolic Christians, the Reformers, the best English Churchmen for the last three hundred years, and the best Evangelical Christians of the present day, have persistently walked. From these “paths” I see no reason to depart. They are often sneered at and ridiculed, as old-fashioned, effete, worn out, and powerless in the Nineteenth Century. Be it so, “None of these things move me”. I have yet to learn that there is any system of religious teaching, by whatever name it may be called, High, or Broad, or Romish, or Neologian, which produces one quarter of the effect on human nature that is produced by the old, despised system of doctrine which is commonly called Evangelical. I willingly admit the zeal, earnestness, and devotedness of many religious teachers who are not Evangelical. But I firmly maintain that the way of the school to which I belong is the “more excellent way”. The longer I live the more I am convinced that the world needs no new Gospel, as some profess to think. I am thoroughly persuaded that the world needs nothing but a bold, full, unflinching teaching of the “old paths”. The heart of man is the same in every age. The spiritual medicine which it requires is always the same. The same Gospel which was preached by Latimer, and Hooper, and Bradford, by Hall, Deviant, Usher, Reynolds, and Hopkins, by Manton, Brooks, Watson, Charnock, Owen, and Gurnall, by Romaine, Venn, Grimshaw, Hervey, and Cecil, this is the Gospel which alone will do real good in the present day. The leading doctrines of that Gospel are the substance of the papers which compose this volume. They are the doctrines, I firmly believe, of the Bible and the Thirty-nine Articles of the Church of England. They are doctrines which, I find, wear well, and in the faith of them I hope to live and die. I repeat most emphatically that I am not ashamed of what are commonly called “Evangelical principles”. Fiercely and bitterly as those principles are assailed on all sides, loudly and scornfully as some proclaim that they have done their work and are useless in this day, I see no evidence whatever that they are defective or decayed, and I see no reason for giving them up. No doubt other schools of thought produce great outward effects on mankind, gather large congregations, attain great popularity, and by means of music, ornaments, gestures, postures, and a generally histrionic ceremonial, make a great show of religion. I see it all, and I am not surprised. It is exactly what a study of human nature by the light of the Bible would lead me to expect. But for real inward effects on hearts, and outward effects on lives, I see no teaching so powerful as thorough, genuine Evangelical teaching. Just in proportion as the preachers of other schools borrow Evangelical weapons and Evangelical phraseology I see them obtaining influence. No doubt the good that is done in the world is little, and evil abounds. But I am certain that the teaching which does most good is that of the despised Evangelical school. It is not merely true and good up to a certain point, and then defective and needing additions, as some tell us; it is true and good all round, and needs no addition at all. If those who hold Evangelical views were only more faithful to their own principles, and more bold, and uncompromising, and decided, both in their preaching and their lives, they would soon find, whatever infidels and Romanists may please to say, that they hold the only lever which can shake the world. 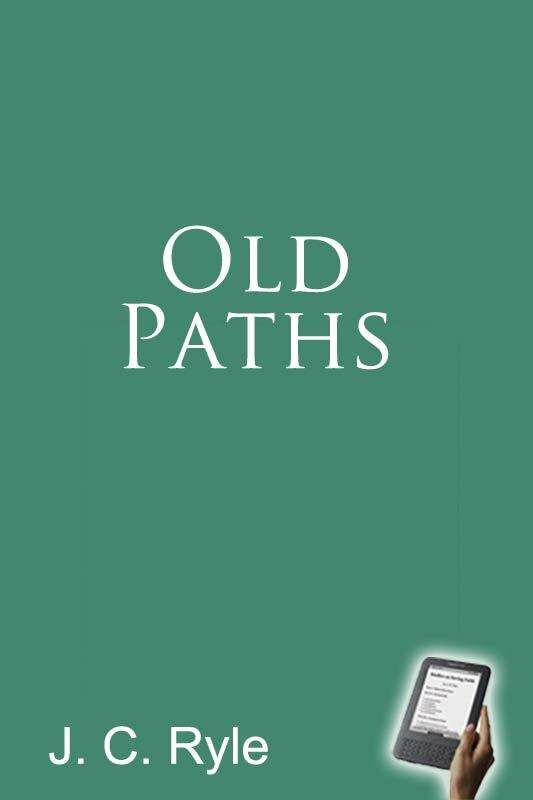 The readers of the many tracts which God has allowed me to send forth for thirty years, must not expect much that they have not seen before in “Old Paths”. Experience has taught me, at last, that the peculiar tastes of all classes of society must be consulted, if good is to be done by the press. I am convinced that there are thousands of people in England who are willing to read a volume, but will never look at anything in the form of a tract. It is for them that I now send forth “Old Paths”. Those who read through this book continuously, and without a pause, will, doubtless, observe a certain degree of sameness and similarity in some of the papers. The same thoughts are occasionally repeated, though in a different dress. To account for this, I will ask them to remember that most of the papers were originally written separately, and at long intervals of time, in some cases of as much as twenty years. On calm reflection, I have thought it better to republish them, pretty much as they originally appeared. Few readers of a religious book like this read it all through at once; and the great majority, I suspect, find it enough to read quietly only one or two chapters at a time. I now send forth the volume with a deep sense of its many defects; but with an earnest prayer that it may do some good. CHAPTER 2 - OUR SOULS! CHAPTER 3 - FEW SAVED! CHAPTER 4 - OUR HOPE! CHAPTER 5 - "ALIVE OR DEAD?" CHAPTER 6 - OUR SINS!